Job openings still seem to be there. A funny thing has been happening in the United States. President Barack Obama and Congress have worked for the last two years to get as many jobs available to Americans as they can. For nearly a year, every month has seen a notable growth in job creation. However, the unemployment rate has remained stagnant. When the rate fell from 9.6% to 9.4% last month, the reason was not that more jobs were taken, but that citizens exhausted their benefits and simply were no longer counted due to no longer searching for work. 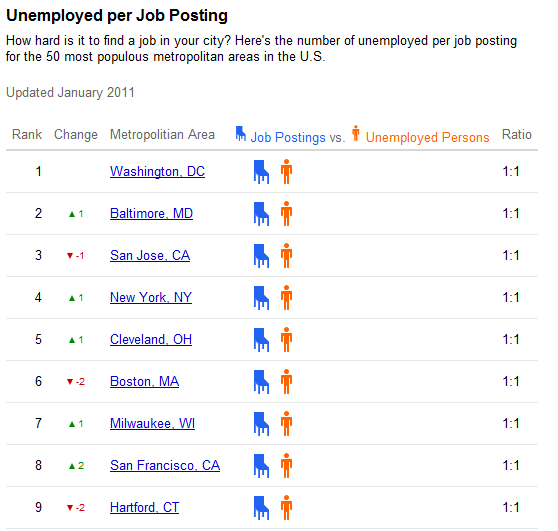 And THAT is the problem with the unemployment situation in the United States. The jobs are there. Over one million jobs have been added in the last year in various industries in the United States. Jobs have been created from high-level corporate jobs to working for minimum wage and in factories. Regardless of education level, there is a job out there that would accept you if you’re smart about it. For every American that has taken advantage of the opportunities created by President Obama and Congress, there are a few who have just sat at home and waited on the unemployment benefit checks to come in the mail. The system should not be knocked, as it is as good as it can be. It’s unreasonable to demand that every single person on unemployment be thoroughly inspected often enough and closely enough to make sure they are not abusing the system. The unfortunate fact is that while some are truly thankful for the assistance from the government and are using it as an opportunity to get back in the workforce, there are those who realized they could just sit at home, reduce their standard of living a little bit, and just collect a check. How can people possibly claim that there simply are no jobs for them when over one million jobs were created in the last year on top of the job openings that were already there? Especially the 99ers who have already collected 99 weeks of unemployment and recently held a candlelight vigil because they didn’t get an additional 13 months. Boohoo! Fix up your resumes, improve your skillset, read some books, learn proper punctuation and get a job like everyone else. If the 99ers want to continue collecting money for over 99 weeks, guess what? It’s no longer called unemployment. It’s called welfare. How Hard Are 99ers Really Trying? The truth of the matter is while it is reasonable that in smaller cities and less populated areas, jobs are scarce and the need for unemployment benefits are really there. But for most of the men and women collecting unemployment benefits, there’s a good chance they’re abusing the system. A reasonable amount of unemployment time is understandable but where do these brash 99ers get off feeling a sense of entitlement that everyone should pool their tax dollars and just hand them to a 99er while they sit at home feeling sorry for themselves while making little effort to improve their own situation. Now, maybe someone who used to make $200,000 a year can’t find a job paying quite as much, but at a time of true desperation, what’s stopping that person from working at the local mall or restaurant? Then there are those who are simply going about things wrong. Other issues include people sending out generic resumes and not targeting their resume towards the company they are applying for. This is common sense and all part of trying to present yourself in the best possible light to get a job. Some people also choose to lie on their resumes and are simply unprofessional by being informal and not being punctual. In short, many who are currently collecting unemployment benefits and are complaining that they can’t find a job are the ones to blame. There are simply too many 99er’s who are either abusing the system or just doing a bad job of applying for jobs. One year ago it was understandable that it was difficult to find a job, but over the course of 99 weeks, which is just under two years, how can one explain not being able to find a job? While some of the 99er’s may have legitimate reasons, for most, can they honestly say that after almost two years of government assistance during which they did not work that they honestly need another 13 months because they truly cannot land one of the over one million jobs out there? 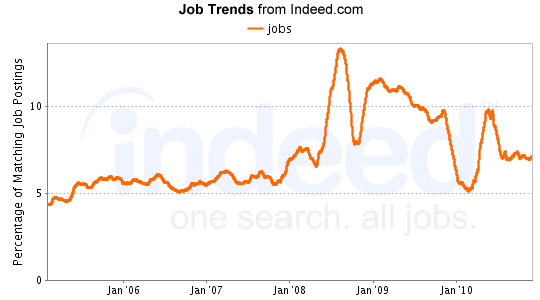 Industry Employment Trends via indeed.com. Wow job growth! 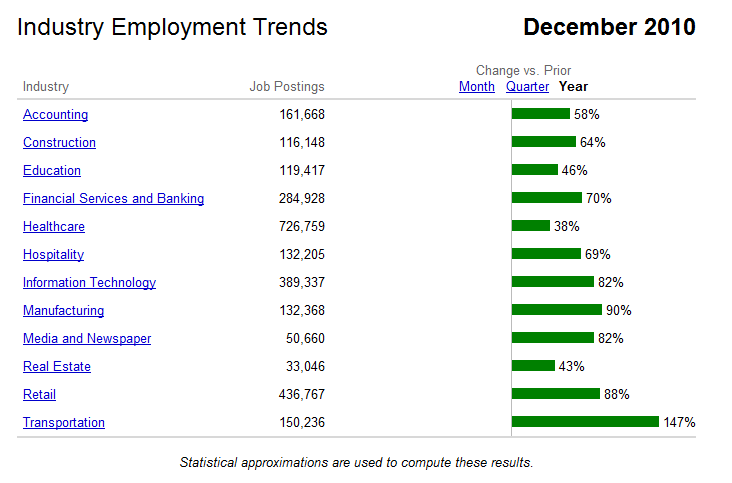 Chart research displays jobs exist... amazing! I told you to get a smaller DOG !!!!!! WTF is there 2 Butches here? Did you pay taxes on that? OMG! This new guy is KILLING me. I’m gonna pass out! Dreamland its 5:30 Go job hunt, if you have a job two won’t hurt! 8:30 here see you tomorrow ,good night all ! Don’t let the bedbugs bite causeican. Or anything else!!!! Its a great night for OVERTIME!! I understand now the people here are used to being poor. Happy you came back causeican. I just made some MO MONEY. Actually Butch I am making $11 an hour and my A** still hurts from catching up on past bills of 6 months…Get a F**king life you reject…Crawl back into that hole you came from. Those against Unemployment handouts should go visit paltalk and download that software, free register and then log in and find the politics section and find tier V to survive unemployment united. I was there a few minutes ago, going back, interesting load of nonsense I’ve ever seen. One person said “if I had known there was going to be extension for 14 weeks I wouldn’t be working the crap job I am working now. Sports in case you missed it. I am mocking this place. In January, job creation was anemic, yet unemployment plummeted. What gives? The answer lies in the quirky way the government decides who gets counted as part of the work force, who gets counted as officially unemployed and who gets left out of the picture. HOW NOT TO FIND A JOB!! Job searching can be tough enough all by itself. There is no need to make it even harder by doing or saying the wrong thing when job searching or interviewing. Here’s a list of what you shouldn’t do. These tips might sound simple, but, you might be surprised at how many people make a mistake without thinking much about it. Then they wonder why they didn’t get a call or didn’t get the job. Make a Mistake. Should a typo in your resume or cover letter drop you out of contention? It shouldn’t, but, it might. Employers typically get hundreds of resumes for each position they list. Perfection counts. Limit Your Job Search. Don’t limit your search by only applying to positions that meet your exact criteria. Instead, having an open mind (remember, you won’t know exactly what the job entails until you interview) when reviewing the job ads will increase your applications and increase your chances for getting an interview. Expand Your Job Search. Sounds contradictory, doesn’t it? You shouldn’t limit your job search, but, there is no point wasting your time or anyone elses applying for jobs you aren’t qualified for. The gentleman working as a child care provider didn’t, and won’t, get called for an interview as a C++ programmer. Job Search Only Online. Don’t post your resume on Monster and HotJobs and hope that your email In Box will start to fill up or your phone will start ringing off the hook. It won’t happen. You need to be proactive when job searching and use all available job search resources – online and offline. Contradict Yourself. If you are interviewing with several people make sure you keep your story straight. Telling one interviewer one thing and another something else is a good way not to get the job. Insult your Former Employer. Even if your last job was horrible and your boss was an idiot, don’t mention it. Speaking poorly about former employers is never wise. How does your future employer know that you won’t talk about him that way, next time around? Underdo It. Don’t be a slob. Candidates who are unkempt, disheveled and poorly dressed won’t get the job. Overdo It. I once worked for someone who wouldn’t hire anyone he could smell before they walked into his office. He might have been overdoing it a little, but, the candidates would have done better if they had minimized the perfume or the after shave. Show Your Desperation. Are you almost out of unemployment? Don’t know where you next meal is coming from? Do you absolutely have to have this job? Don’t give an inkling of any of that away. You want employers to believe that you want this job because it’s a good opportunity and you can be an asset to the company, not because you need to buy groceries or make your car payment. Show Your Tattoos. If you are applying for a position in the corporate world, and other worlds too, you might want to cover up your tattoos and remove some of your rings if you’re pierced in lots of places. They probably won’t impress most employers. Give Up. Regardless of how good the job market is, job searching isn’t simple, and it’s not always easy to stay positive and focused. When you’ve sent hundreds of resumes without much of a response it can be difficult to keep going. It’s important though to keep plugging away, to use all the job search tools available, and to keep a positive outlook. I think there’s far too much talk and pressure about “how to find a job” and “how to reinvent yourself,” don’t you..? Instead, how about embracing the recession and taking some time off to relax, have fun and veg out? Just think, you could watch day-time television (Oprah, Ellen or the sports channel), go play some golf, visit the gym and sit in the sauna (but tell everyone you’ve been working out), play online poker, have fun on Facebook, hang out in coffee shops and “do lunch” with friends. You could stay up late to watch trashy “made for TV” films whilst eating a tub of Haagen Dazs and corn chips. Maybe buy some completely useless items from the late night shopping channels and wake up the next day when…..well, whenever you like. With such a lifestyle, why would you want to spend time looking for a job? Oh yes, I forgot – it’s not socially acceptable is it? You’ve got to at least “look” as if you’re trying to find work. So why not bluff your friends and family into thinking you are working really hard at the job searching but sabotage it?! To ensure you don’t find a job, just stay focused on the past. Keep talking about all the things you’ve done, all the experience you’ve had. Don’t think for a second that this may be futile in a new world and a different climate. To guarantee you can continue enjoying lazy lunches and some ‘”me time” (even though you’ve no idea what it means) just blame someone – anyone! After all, it’s not your fault you’re struggling to find work – it’s the government, the greedy bankers, your incompetent employers, the hopeless recruiters, your mother-in-law, the next door neighbour’s dog and of course …….”The Recession” – the very best excuse for 20 years to play the blame game and do nothing! This is a great one. If you’d rather play online poker or poke a few people on Facebook than get back to work, hide behind your computer for 7 hours a day pretending you’re job searching. You can sit in your PJ’s in front of your laptop, apply for a few random jobs, send your resume to the same recruiters and job sites that everyone else is emailing and then sit back and say “Oh, I’m working sooo hard on my job search – but there’s simply nothing out there!” Genius. You’ve seen a job ad or been given a warm lead. Damn it – your plans to relax and do nothing seem scuppered. OK, here’s an idea. How about you procrastinate, put off the call for a few days until you’ve perfected your resume or put off making the call until tomorrow when you feel better about yourself. That way, by the time you apply, the warm lead is cold, the job advert is inundated with other people so you don’t get to interview stage at all. Brilliant – you can then continue enjoying some more time on the couch with Oprah! This one always works. Be really really desperate, needy and annoying. Just enough so that it puts people off. That way you can look like you’re trying really hard but just not getting the breaks. That way you can justify taking a break from the job searching – you know, just to “take a step back and review my options”. Perfect plan! (But if you decide that you actually want to get a job – stop trying so hard. Be open-minded and flexible, but also be confident and self-assured in the way you conduct yourself. Believe you’re someone that has some value to offer – and then behave accordingly). So there you go – 5 ways NOT to get a job this summer. 5 ways to ensure you can spend more time improving your golf swing, watching reality TV and seeing how many juicers and useless knives you can buy from those awful shopping channels. Another great article, older but still worthy! I don’t understand able bodied people who do not want to work. Not long ago, I was approached by two men in a parking lot who “needed some gas money“. They both looked healthy enough to work but instead were begging for change from people buying groceries for their families. ”Why can’t they work?”, I thought to myself as I walked to the car. How many times have you seen people standing at the bottom of a freeway ramp begging for money? They can stand up all day and hold a sign, but are unable to work. What’s wrong with this picture? I wake up every morning and go to the same job, at the same place, dealing with the same issues. It gets old and there are days when I’d rather just stay home. Doesn’t everyone feel this way at times? The reality is that work is part of being an adult and living in society–we all need to be productive. Why is it that some people think that they should be able to live a comfortable life without working? As adults, we all get to make choices and live with the consequences. Some people decide not to work and then try to escape the consequences by looking to others for support! They do this by asking for money at the supermarket, applying for government welfare programs, or just living off the generosity of others. When people don’t work, they are not contributing to society. This puts a burden on responsible working adults who end up paying for them in the long run. These people are living off the labor of others. I recently discovered a blog where someone was asking for ”milk and diaper money“. They even had a link to Pay-Pal on their site. Well meaning people are giving them money–too bad. I can think of other troubling situations like husbands who make their wives support them or wives who stay home and play when their husbands are slaving away (although this doesn’t affect me unless they are applying for welfare). I also am troubled by people who depend on frivolous law suits, bogus insurance claims, or other scams for their income. These people put a lot of energy into figuring out how to not work. Wouldn’t it just be better if they put that same energy into finding a job and keeping it? Don’t get me wrong, I believe in being charitable–in fact, we all have a responsibility to help others in need. It feels good to help a family that is really struggling, or someone with health issues, or the elderly, etc. Sometimes people just end up in difficult circumstances and need help–I completely understand this. With all of that said, I believe that we are actually doing harm by helping those who choose not to work. We are enabling them, the same way we are enabling an alcoholic or a drug user. I’m not talking about homeless people, those who are disabled, the elderly, or special needs people. I’m talking about normal people who are lazy and just don’t want to work. These are able bodied people who want others to pay their way and are very good at figuring out ways to work the system. If these people don’t want to work, they should have to live with the consequences. Hunger can be a great motivator! What do you think? So have 15.7 million other Americans. Another 16 million sit at home hoping their luck will turn. They, too, were idled to some degree by this Grave Recession. More than 31 million Americans share your strain – sleepless nights worrying about the bills, dreary days surfing job listings, weekends shopping for cheap eats. They share your pain – calls from debt collectors, no calls from employers and higher prices for things they need. And they share your drive to survive, to get back to work, to rebuild their lives. Why pass legislation to help the 99ers? I have to say i love reading articles like written by people who completely clueless. According to this article we unemployed wish to be unemployed. There are all these jobs open in factors for minimum wage and like. Sure doesn’t matter if you have a house, wife a few kids to support. You should be smart and be able to support them on $300 a week. Maybe you are single, maybe just paying rent, food, student loans. So what do you do when you are living on as small as a budget possible, you don’t eat out, go on vacation, and just survive and then are offered a job that pays 50% less then you need to survive, hey you should take it and show up people like the writer of this article. I have am today one of those 99ers. I am college graduated, i am single living a basic, my only real big expense beyond, rent, good, insurgence, utilities, phone, is my student loans which nicely take $300 more a month from what i don’t have. But i pay it. I have applied for over 1400 jobs, i have been interviews at least 300 times, 20% or these jobs are still hiring cause they just want to find the perfect match though ever single candidate out there. another 40% of these jobs underwent hiring freezes cause of fear of more loses in the economy. another 30% of these great interviews are recruiters hiring for the same position that all the others are hiring for. Good example of this i have interviewed with 24 recruiters in a month all for the same job, where all said if you can speak Korean its a plus but not a requirement, and when i actually interviewed with the client the only thing that i lack that they required was bilingual and the rest just takes time to hire people. 3 of which i have met with three times over a 8 month period. No one is taking advantage of the tax credits, no one is rushing to hire anyone. nothing. So now what do i do a month from now, when i am cant pay my bills, by back account has maybe $3 in it, i have interviews to go to and cant afford the commute anymore and my student loans begin default killing me even more. take a job where i it doesn’t even cover 1/3 of my minimum budget. I would never wish unemployment on anyone, but people like you may need to be like the rest of us lose everything to understand anything. For nearly two years, John Boehner has been complaining nonstop about job growth. “Where are the jobs?,” he grumbled, over and over again. In many states, the crunch will come in two years, when it’s time for the states to begin paying back the federal loans, says Rich Hobbie, executive director of the National Association of State Workforce Agencies. We Americans suffer from motivational and financial retardation. We are lazy and arrogant when we choose not to work because we think jobs available are beneath us. We are economically stupid when we live above our means. We choose not to make sacrifices to buy the things we need but instead buy the things we want. Case in point, my nephew will not pay a monthly health insurance premium of $325 for to cover himself, his wife and infant child but instead chooses to pay $450 each month for a cell phone and tobacco habit. Give a man a fish and he’ll eat for a day,…….look up the rest! I myself would like to meet some people who do want to work. I am a physician and spend much of my day with patients that bring in disability forms so they don’t have to work. Some of these patients are younger than 20 and have never had a job before. Just today a woman wanted disability for an ingrown toenail not to mention a bunch of narcotics and i had a man who wanted to be disabled for a plantar fasciitis. Americans have gotten used to playing the system and expected hand outs. They are abusing it so much that those in true need are unable to get assistance because the courts are bogged down with fake claims. At a $100 per person Holiday party in Boston last night, Massachusetts Senator Scott Brown told his affluent audience of supporters why he cast the deciding vote blocking extended unemployment benefits. “Anyone who is unemployed in this great land of opportunity after 6 months is obviously not very serious about finding a job,” Brown told an enthusiastic audience. “These lazy loafers are sitting around the house all day in their underwear watching cartoons and Judge Judy instead of beating the pavement looking for work.” In response, the crowd burst into laughter and gave Brown a standing ovation. Brown in closing, explained why extending the Bush tax cuts to the wealthiest people would help create jobs. “Without your $100 ticket, none of the people waiting on us here would be working tonight. Thank You ZZ for posting this too…. Love Big Daddy more, but gotta give credit where credit is due. Butch, Mobs/causeican/taxpayer are THREE different people, trust me, I know. Why does it seem this Jobless character is being picked on. What has he ever done to any members/commentators here? Ive seen him on that forum and he has been very helpful and supportive to many people, including ones who have talked about suicide MANY times. Ive seen him put up with a lot of BS from folks, but just brushes it aside, hoping that deep inside there was a “real” good person. Boy was he an idiot. Sometimes folks make the biggest mistakes in their lives and realize it. Other times they will soon or later find out they did, and when they do. Its TOO LATE. watch what you say, you think you are the only one who has the law in the family? I have witnesses when I contacted you and how often, is this a threat? I have all of your conversations for months, so bring it? Well good morning people , another day another dollar , time to get to work ! Due to several complaints, comments have been temporarily closed while we look into the situation. Please check back shortly for an update.